Has the Congress lost it in Kerala? There are political protests and then there are political protests. A 132-year-old political party which claims to abide by the Gandhian philosophy of non-violent and peaceful protest has been reduced to the brutal public slaughter of a defenseless, gentle animal, just to prove a political point? Youth Congress members and several other student bodies on Saturday held a beef festival in protest of the Centre’s decision to ban sale and purchase of cattle for slaughter. 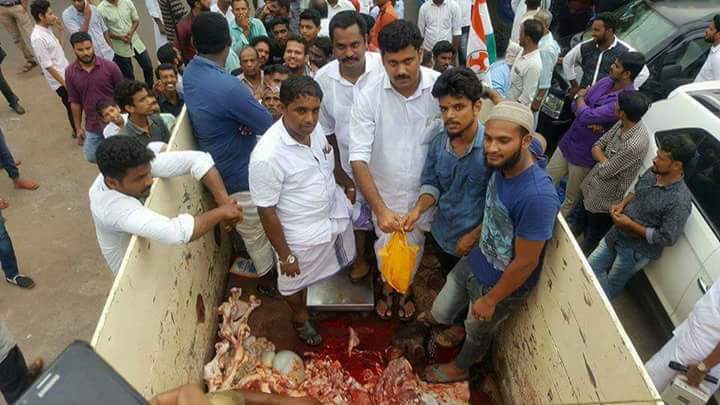 In Kannur, Youth Congress leader Rijil Makkutty decided that a mere protest was not enough – he needed to prove his point through a gory public spectacle by slaughtering a calf pinned to the floor of a small truck, amid chants of ‘Youth Congress Zindabad’. Cricketer Sreesanth was one of many who took to social media to express their pain and anguish at the barbaric act by the Congress worker. Some twitterati pointed out the irony that a party which once conducted its election campaign by projecting itself as a savior of the cow, is today resorting to public slaughter of the same cow to pander to its electoral constituency. Political posturing notwithstanding, Nehru’s Congress never really cared for the cow. PM Nehru and his sister Vijay Lakshmi Pandit had once physically assaulted sadhus who were peacefully sitting on fast outside Nehru’s home in Delhi to campaign for ban on cow slaughter. Indira Gandhi had ordered police firing leading to death of many sadhus campaigning for a ban on cow slaughter in 1966. The events in Kerala have an eerie similarity with similar public slaughtering of cows carried out in Kashmir valley by Islamic radicals like Asiya Andrabi. Such acts of bovine slaughtering happened in late 1980s as well in Kashmir, just before insurgency, as a mark of protest against Bharatiya state. Such slaughtering has nothing to do with eating – it is rather an act of sedition against Bharat and a deliberate attack on its Hindu population. Even the Dalit Sant Ravidass ji preached against cow slaughter – this shows hollowness of those who claim a Dalit-Muslim-Christian consensus on beef eating.